The grout that sits between concrete slabs or bricks in some patios, pathways, basements, and garages is made as strong as cement. It has the strength to hold your brick and concrete walkways together for years. However, due to cracks that form over time, eventually repairs will be required. Not fixing cracks and damage in a timely manner can lead to an unsightly appearance and further damage. 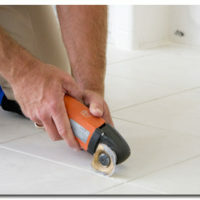 Repairing concrete grout is a simple task that requires a grout saw and grout. To learn how this process works, read on! Remove the grout that has been damaged. You will need to scrape away the grout using the blade on the back of the grout saw. Dig down into each side of the tile where there’s damaged grout. You don’t want to leave any old grout on half of any slab or tile that you are going to be regrouting. Use a vacuum to remove the debris and dust that you have created from the removal process. Don’t use water on the area. Mix water with the grout powder inside of a bucket. Stir this mixture thoroughly with a putty knife that’s wide. It should become a thick mud. Then allow it to sit for about ten minutes before stirring it again. Spread the grout into the lines of the tile that have had grout removed. Press in the grout using a grout towel and scrape off excess grout from the surface of the tile. Allow the new grout to dry for about ten minutes. Using a damp sponge, you can wipe off the excess grout from the tile. Once the new grout has cured for the length of time mentioned in the manufacturer’s directions, seal it. Having your cement regrouted is not a complicated process. However, to ensure everything is done correctly and looks great, we always recommend hiring a professional. Decorative concrete structures always looks their best with professional grouting. For decorative concrete in Colorado Springs, you can trust Flat & Fancy, Inc. for your needs. For any type of regrouting services, contact your local Grout Medic or call 1-888-994-7688.